After you get out of the ship and head to Costa del Sol, Rufus shows up, makes it clear he doesn't like what Heidegger is doing, and disappears with a helicopter. There isn't really that much to do here, though you can pick up bits and pieces of information and a few handy items, and stock up with various interesting items. Hojo was lying on the beach, just before you arrived, and Hojo's guest seems to give you the idea that Sephiroth was seen in the town and fled to another direction. The Fire Ring is a pretty neat accessory, so don't forget that! There is an armor merchant in the bar selling Platinum Bangle, Carbon Bangle, Four Slots, and Molotovs. Be noted that the Four Slots will no longer be available after a certain event. There is also an item shop by the Inn, the patron seems to suggest buying Softs, so grab some for the road ahead; as well as a materia shop. There's really only one way to follow after you leave Costa del Sol. Once you reach mountains through the zig-zagging paths, you'll end up in a place where a man is resting in a tunnel of sorts. He seems to have seen Sephiroth. Press onward, and once you go over that top of the trail, you end up in a big Mako reactor. You may think it's a good time to start exploring now and see where you can get, but most of the monsters in this area will be pretty hard to kill, so for now, follow the tracks leading down. If you encounter a Bagnadrana, steal the Diamond Pin for Red XIII. Diamond Pin from Bagnadrana near Corel mountains. Wizard Staff (weapon for Aeris) on the left. Star Pendant on the right. There's a save point along the rails, and on the top of one of the slopes, you can find a chest with a W Machine Gun (weapon for Barret). You can also find a Turbo Ether and a Transform materia. At the rightmost part of the rollercoaster section, go down, and you'll see that the rest of your gang has found what seems like the only way forward, except that the bridge is up. Backtrack, head up, and go to the booth to switch down the bridge. You can climb to the top across from the shack where the music is loudest to take 10 Phoenix Downs from a bird's nest if you wish, but be prepared to be attacked by the hen! When you head back to the lower bridge to follow your friends, you can take a detour on a railway going left. Follow it down and around the ledge. There will be a hidden cave where you can get a Tent, Mind Source, and a Power Source. You can also talk to a guy on a bulldozer. When you're done, head back and follow your friends. Then there's one last long bridge. Some Bombs seem to be stalking in this area, and these things have a really annoying habit of exploding in your eyes; dispatch them with Ice2 before they cause too much damage. Oh, and the bombs do not yield any experience or any AP or any gil after winning, unless you do enough damage to one-shot them (around 700HP). North Corel doesn't have much to see right now either - aside from Barret getting really sad and all after getting yelled at by some of the locals. There are shops, but save some money for the next section. One of the guys says that a mysterious man, with tattoo number 1, and a really cool black cape, headed to Gold Saucer. You need at least 3,000 Gil just to enter there! Or you can garner 30,000 gil for a lifetime pass to the Gold Saucer. If you can afford it, you can buy a Force Stealer from North Corel - a nice double-materia-growth sword for Cloud. If you are low on money, you can go right, which leads to the world map - you can't get much further out yet, though. Rest up though to get your MP and HP back without expending items before heading right. The monsters here are stronger, and it has been noted that Harpy which you can steal a Diamond Pin from can only be confronted if you have the Chocobo lure equipped. Or, you can head left to get to the North Corel ropeway station. Here, Barret will tell a little bit more of the destruction of Corel town before you get aboard the ropeway car. At this point, Gold Saucer is really not that fun or is a bunch of fun, depending on how you look at it. There's plenty to do here to earn rewards, some useless, and some very worthwhile. But you've still got to pay for entry into the most lucrative enterprise for Shinra. Pick whoever you want to go with you and then proceed to Speed Square. In Speed Square, you meet Dio, the owner of Gold Saucer. He tells you about Black Materia, and how this tattooed cape guy wanted one. He hints that you should check out the Battle Square. Regrettably, you can't get there yet. There is a whole section dedicated to the Gold Saucer activities. Check out the side quest for Gold Saucer. In Wonder Square, you'll meet another character who wants to join you: Cait Sith. He'll give you some weird fortunes and then a very ominous one first. He comes with two cool Materias: Manipulate and an almost leveled-up Transform. In Battle Square, you find that everyone's been shot. Dio isn't very happy, it seems. You try to flee to the Battle Arena but Dio is more clever than that. As the judge, jury and executioner, he does a really quiet-like trial and sends you to the desert prison enjoying a life sentence. The desert prison is a rough place, but mostly because there are enemies that either try to steal stuff from you or explode in your face. So be quick to dispatch the Bandit if you encounter one should you want to keep your stuff. You start here with whoever you picked to be with you in Gold Saucer, and Cait Sith. Head to the larger area below. There is a pest for a person following you and laughing in your face, ignore him. A lot of people here seem to suggest that you can get back up if you win a Chocobo race. Also, this Boss person seems to be in charge. You meet Mr. Coates in the bottom of the area, but it turns out he's just an underling. There's a save point here, as well as a bar on the bottom right corner where you can buy some supplies. Barret, whom you misplaced temporarily, is in the bigger house on right side. Barret kills an eavesdropper behind a couch and then the rest of the folk come to hear about Barret and Dyne's story. In the end, you need to pick one character besides Barret to your group. You can grab the chance to rest for free in the cab of the Shin-Ra truck. Head back up past the save point, through the gate. Go up again, you'll note a manhole with an empty chest in the bottom, through the gate on the left; into the desert. Go through the open gate on the right, into the area where a guy is walking in circles. Then, keep running to the right. You'll reach an area with a big crack in the ground. When you reach the area with the wandering man, stroll about until you get into a battle with Death Claw. You can learn the Enemy Skill Laser from him. This is the only point in the game where you can learn it until Disc 3, so use this opportunity while you have it. Now that you have the Manipulate materia, it should be a piece of cake. Just manipulate the Death Claw and have him cast it on whoever has Enemy Skill materia equipped. Also, you can learn Matra Magic (if you haven't already) from Bull Motor in the general Corel Prison area. At this point, you should equip Barret pretty well, because the Boss person shows up here. 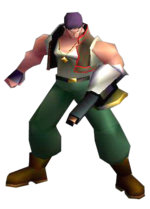 He seems to be quite bitter and wants to kill Barret, and Barret fights him alone. If you haven't used Barret much since Midgar, you probably have him on a pretty low level (~18-20) when you meet Dyne. In this case, a good strategy is to attack and heal in turns. On higher levels, you may be able to attack for two turns and then heal - but in any case, you need a lot of healing, because Dyne has some pretty nasty attacks. You may not even need to use normal attacks, because in this fight Barret's limit bar tends to shine red hot every other turn anyway, even without Fury status. Aside from physical attacks, summons work well. The Flame Thrower Enemy Skill and Fire2 are good against him, and you'll see pretty good results with Ifrit as well. There is also the cheap to way to win, but it takes a bit of work before combat. You will need Barret's second 3rd level limit break, Angermax. To build it up beforehand, just run around in the previous screen until you encounter the Death Claw enemy, which can be manipulated to use Laser on Barret. When Barret's limit bar is full, simply run away or kill off the enemies through non-Angermax means, and then enter battle with Dyne. Angermax delivers an one-turn kill under most circumstances, but make sure that Barret can survive at least one attack from Dyne. Also, if you want to minimize the amount of damage you take, change to the back row. You'll do less damage, but you'll also get hurt less. After beating Dyne, he throws a piece of jewelry to Barrett then jumps off the cliff to his death. Get the Ramuh materia in the Chocobo Jockey room. Now Coates seem to be more eager to sign you up for a Chocobo race, and a woman called Ester shows up and becomes your manager. Ester gets you to the jockey room by elevator and explains how to control the Chocobos. In the jockey room, there's Ramuh materia which you should definitely pick up. For specifics on racing, see the Chocobo section. A simple hint is to hold down + + + 1+3, which reduces your Chocobo's stamina drain while racing. Actually, you can't mess anything up here; if you lose, you get to try again, and again. Once you win, Dio sends you a letter of congratulations, gives you the Buggy, your first vehicle in the game, and hints that Sephiroth went to Gongaga. This page was last edited on 4 March 2016, at 20:28. This page has been accessed 89,941 times.